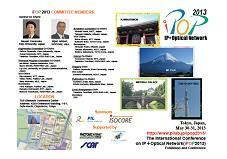 iPOP2013, May 30-31, 2013, will be held at TKP Otemachi Conference Center in Tokyo, Japan. The conference is intended to share among the industry and the academia communities, the knowledge, new findings, and experience on the state-of-the-art of "IP and Optical Networking technologies." Within the theme we intend to demonstrate IP & MPLS/GMPLS networks and SDN equipment (IP routers, ODU XCs, Optical XCs, Ethernet switches, MPLS-TP nodes), protocol test equipments/tools, network operation support tools, and other related issues. In addition, we intend to showcase SDTN (Software Defined Transport Networks) which aim to expand SDN into metro/core transport networks. The iPOP2013 anticipates a draw of over 300 attendees, made up of network operators, service providers, and equipment vendors. Join us and other industry leaders in the IP+Optical network technologies and leading source of industry information for GMPLS technologies. (ipop2013-exhibition@pilab.jp) by April 8 2013. Exhibit space is limited and will be committed on a first-come first-serve basis. Exhibitors will be obliged to provide electronic data of poster panel by the middle of May 2013, which will be uploaded to the website of iPOP2013. Note: The width of each booth level may change. *1 JPY 100 (100 Japanese Yen)=$1.06(1.06 US Dollar) as of Feb.12,2013. *2 Desk(s), chair(s), and Internet access may be supplied from iPOP2013. *3 Platinum and Gold level exhibitors eligible to get the right to make a presentation in Business Session by request. We may not be able to accommodate all requests for Business Session due to time limitation. 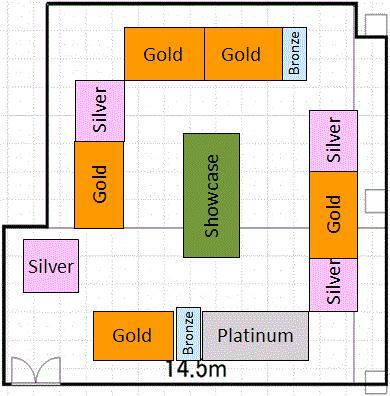 *4 Platinum, Gold and Silver level exhibitors eligible to get Showcase area by request. We may not be able to accommodate all requests for Showcase due to space limitation. Note: Platinum and Gold booth spaces are limited and will be committed on a first-come first-serve basis.